Last December, I was in the Anaimalai Hills range, along with my photographer friend – Anoop. 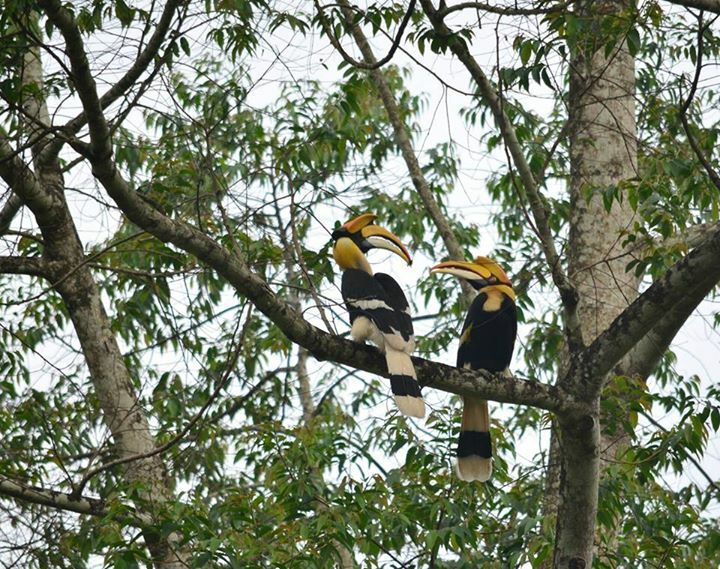 We had heard from the locals in a sleepy town that Great Hornbills haunted a particular 5-kilometer stretch in Valparai during the wee hours of the morning. We visited the spot on a Saturday evening to scout the whereabouts of its largest trees. We had company. There were other photographers and birders. Most of them were in possession of expensive equipment. A mess of eager eyes and hungry lenses hoping for a Hornbill sighting at dusk, We exchanged plastic smiles. The oldest of the bunch, a man in the bluest sweater I have ever seen, told us that he had heard a loud call a few minutes ago. We immediately joined in and looked towards the direction he was referring to. After awhile, I sauntered around, distracted by boisterous a family of Black Langurs on a nearby tree. They were having either a territorial scuffle or a blue-collared paw fight over a breakfast spread of berries with three Malabar Giant Squirrels. The daughter of the man in the blue sweater suddenly pointed her fingers upwards with élan. Two old ladies scrambled to find their digital cameras. From a short distance, I watched Anoop kneel down and fiddle around with his camera. I ran towards them. I just knew. Having reached there, I realized that the moment had passed. But my friend excitedly showed me a blurry image of an orange crest. So orange that one might have suspected that it was a sunset spillage of the smallest proportions. It was the Great Hornbill’s head. I jumped up in the air, unable to control my excitement. Everyone looked a little bit intoxicated apart from one lady who gave me the stink eye for the leap. We waited, hoping to catch another glimpse. Two hours flew by, but he never returned. We left for the day, agreeing to get back the next morning before the sun shows up. And we did. A good 30 minutes before first light. On the way, we spotted an Indian Porcupine (the largest I had ever seen), a herd of Indian Gaur and a frightened female Sambar Deer. We reached the location by 5:15 AM and started prepping our cameras. A pall of gloom descended on me as I realized that mine wasn’t working. I just couldn’t switch it on. Thirty minutes later, as daylight was fading in, lady luck was amiss. Spotting Great Hornbills would have meant the world to me – with or without the camera. However, either my vanity or my fascination for spreading the love for birds kicked in. I felt a tad upset. But I knew Anoop was a talented photographer and it made me feel a little better. I slung my accursed camera on my back and went into birding mode. As luck would then have it, we heard a surreal and soul-crushing helicopter sound. The air was thick with anticipation. As that peachy colour in the skies was turning pecan pie yellow, a dark silhouette of a male Hornbill flew past our heads and landed on a huge tree. I jumped again because something I think I am a Sunday morning cartoon trapped inside a middle-aged man’s body. As we jogged towards the tree, trying to be as silent as possible, another flew from behind us and towards him. I didn’t have enough jumps in me. And we didn’t have a clear shot of them yet. So we ran around, like characters in Zelda, trying to find a good spot. And when we did, Anoop’s memory card ran out of space. I pulled out the one from mine, but by then – they had disappeared behind the branches. For the next three and a half hours, they hid from us. But we knew they were in that tree. We also spotted numerous Small Minivets and a Lesser Flameback. Finally, when the Hornbills emerged from the thick clutters – a familiar flashing message appeared. “Memory card full”. Mine too. Anoop, without saying a word, took off to his car parked about 800 meters away. He had backup for a backup because that’s how some people function and we, the disorganized masses, should be thankful for it. 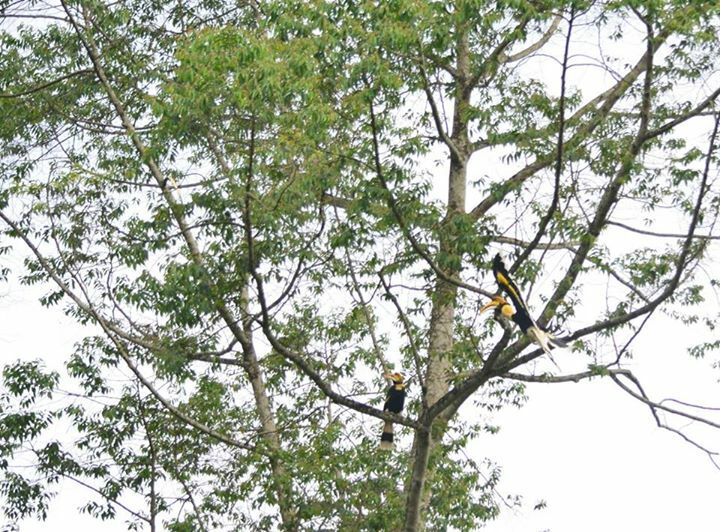 By the time he came back though, the Hornbills had flown away in different directions. We scampered around, looking for them but they seemed long gone. Despite the weird coincidences, we began walking back, feeling content. We spotted Great Hornbills. Did anything else really matter? And then, dear readers – I kid you not, out of nowhere, I saw a yellow figure about 500 meters away from us. It was the male Hornbill comfortably perched on a branch. A few seconds later, the female swooped down the bright blue sky and landed right next to him. Since it was a mere few days away from mating season, they were engaged in a ritual that saw the male feeds his partner. For the next hour, they stood there, seducing each other, and charming the love out of us – as Anoop took some fantastic photos. It was one of the most beautiful birding experiences I have ever heard. Like an emotional roller-coaster that was worth the turbulence. As Lady Luck would have it, during the next (solo) trip to Valparai – I managed to photograph the same couple. This time the male Hornbill was feeding his roosting partner (the featured photograph and the gallery below). The poem is a perfect segue to your birding story which is an absolute delight to read. You sent me scurrying to Google images to look up the creatures you spied on your quest for the Great Hornbill. But the best image you created for me was you as “…a Sunday morning cartoon trapped inside a middle-aged man’s body.” May we all have that capacity for being excited by nature. I have similar sentiment as menomama3. The same description made me smile. Woo hoo! My adrenaline was rushing reading your story. I saw wild horn bills while living in Malaysia many years ago, but I wasn’t a photo taker yet — but I got video. The pair was in a mangrove on the beach and they were just up and over to where we were relaxing. They are fantastic birds! We (sadly) don’t have them in America. So…the photos are Anoop’s then? Did you ever figure what was wrong with your camera? Isn’t birding the best? So apparently the charger cable disconnected itself and never charged.but the kicker is that the camera was switched off, and had to have retained some battery life from the previous night. The real leaping jump kick to the head is that when we got back to the room it switched back on. Also, I never wrote about this because well I don’t know. The next day, when we were trekking through a plantation, we spotted a pair of Grey Hornbills too. Guess whose camera switched off at that very second when I zoomed (Psssst my friend had left his camera behind too). And yeah, Anoop took all these photographs. I refused to touch the camera, afraid I may jinx it. Oh how utterly wonderful!! Happy New Year! Get to Valparai before this year :D, I ll email you the geo location details to the tree! I have never been interested in birding, maybe out of sheer ignorance. But your posts are inspiring me to jump on the bandwagon. And I might just do that! Aww that’s just perfect. Thank you for saying / feeling so! Wow! A courting hornbill couple posing for you!! That be luck indeed 🙂 Have only seen fleeting flashes of colour myself. 🙂 I am sure by the time you are done wetting your toes in alien shores, paintbuckets of colour will be at your behest. Hornbill in Sarawak, Malaysia.. According to the locals, only people with good karma will be able to see the beauty of the wild in Sarawak..especially the Hornbill..
What a story. And lovely photographs to accompany. Hornbill foreplay played out in a forest with a passionate birder as witness and then a wonderful story that allures someone like me to read and re read !!! Wow !!! Lady luck can take a bow and am feeling so happy I ever came across your blog ( Cheshire cuteness or not !! !l ) . I love your photos, so clever!